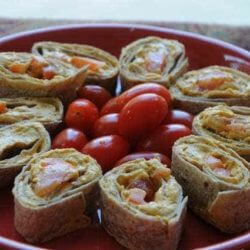 1 whole wheat tortilla 2 tablespoons prepared hummus 1 chopped, ripe plum tomato 16 cherry tomatoes Spread the whole wheat tortilla with the hummus. Place the diced tomatoes on one end and roll tightly. Cut in 1 inch pieces and arrange in a circle on a plate. Place the grape/cherry tomatoes in the center. 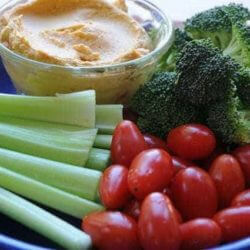 240g hummus 1 bunch celery sticks 16 cherry tomatoes 90g broccoli florets (tops) Place the hummus in a small bowl. Arrange the veggies on a plate surrounding the hummus. If you want a little red color on the hummus you can add a little tomato paste. 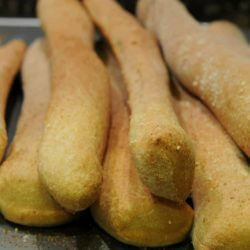 Here is a recipe that is very easy to make and yields great results that are kid tested. 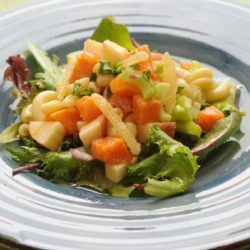 This warm pasta salad is a perfect meal for when fall nips the air. Did you know that October is National Pasta Month? 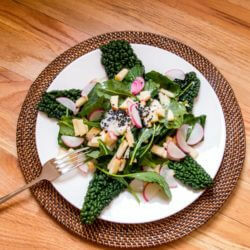 Using steamed and raw kale, this salad is a star and it looks like one, too. 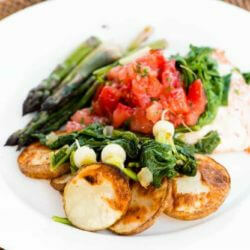 You get a whole dinner plate of fruits and veggies for just over 150 calories and 5 grams of fat. This dish comes together in a snap!